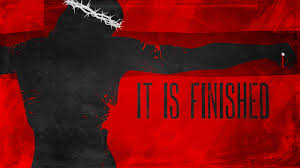 “It is finished.” The plan of redemption was completed at this point. Jesus had suffered and died at the hands of those He came to save, just as God had planned it before the earth was formed. Jesus had to give up His Spirit in order to do what He had to do in those three days before the resurrection (Ephesians 4:8-10,1 Peter 4:6). He had already promised His Spirit to those that needed Him most – believers. By giving His Spirit, He was no longer contained in a single body in a single location. The Holy Spirit is now our gift, given freely, to allow us to be in Him by Him being in us. His Spirit is the bond of peace within the Body of Christ, all believers. It is not a peace that can be compared to the world’s view of peace. His peace lingers, and rests in us. His Holy Spirit continually connects us to Him. He abides in us, and allows us to abide in Him.